If you love the food scene in Durham, you sometimes think it can’t get any better. But every now and then, you still run into some very impressive surprises. 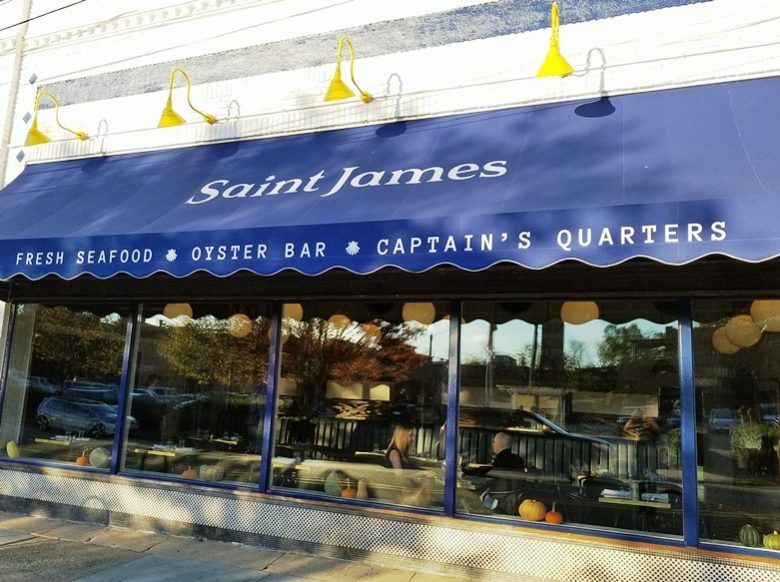 Take the new Saint James Seafood Restaurant out on W. Main Street! 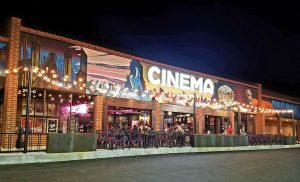 While I knew that Chef Matt Kelly (Mateo, Mothers and Sons) was leading the build-out of the space and I was impressed with his resume, there have been so many new openings of late, I lost track of the Saint James. And located in the old Fishmongers space, I had concerns about what the Saint James would be about given how basic the decor had been. But as luck would have it, I was in Durham the day Saint James Seafood opened up and decided to change my dinner plans to see what all the hub-bub was about! As I approached the Saint James from across Main Street, I really wasn’t sure what to expect. Bright Duke blue awning, large plate glass windows, I spied a handful of diners inside at 5:30pm. Peering inside, I’m met by the host and hinted that I was probably only going to stop in for a drink, so I’m seated at the bar. But I can tell you for sure that the decor and interior of Saint James Seafood is totally unrecognizable from the previous tenant. Gone are the long and worn wooden benches to be replaced by a beautiful and modern nautical theme throughout the dining room. 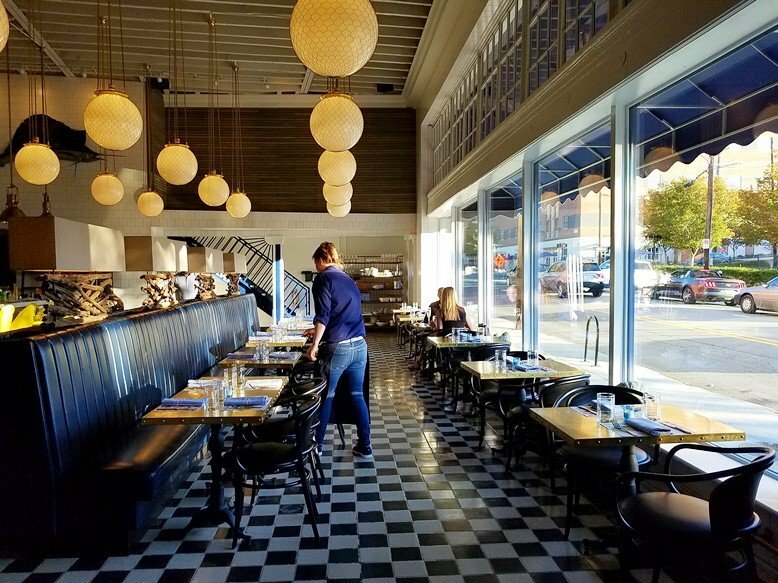 Black and white tiled floors, patterned white globe lamps overhead, deep blue and yellow leather seating and stools show off splashes of color and style throughout the space. 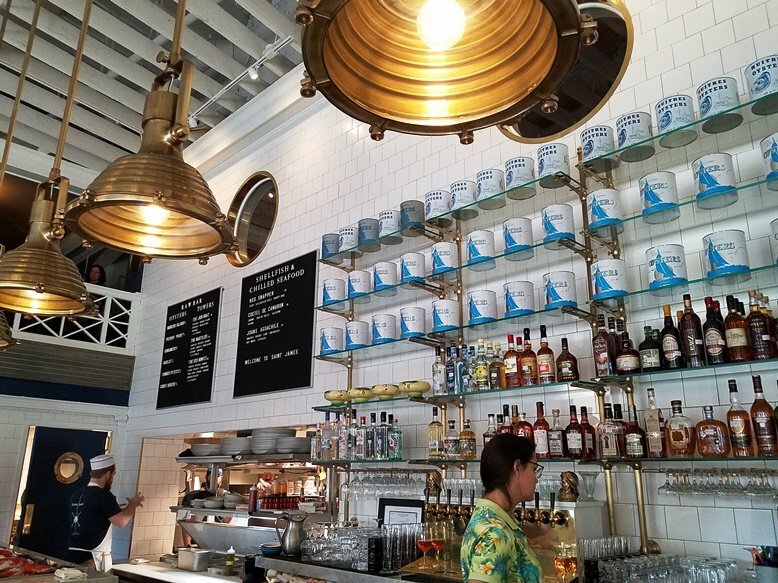 The white tiled back-wall behind the bar is classic seafood restaurant style and reminds me a bit of my trips to New Orleans. At the bar I take in the whole scene and it’s a breath of fresh air. The staff here is decked out in colorful Hawaiian shirts while the kitchen is in classic navy and white aprons. There’s several displays of fresh seafood on ice and the beautiful brass lamps overhead resemble spotlights that you might find on an old merchant ship! I put in an order for a Fog Cutter drink (rum, gin, brandy with fruit juices) and start to take a closer look at the menu. And it’s a really interesting menu covering raw seafood, baked oysters, 10 or so appetizers and 8 seafood entrees along with some Calabash-style seafood plates. It’s all quite ambitious for a new restaurant but after perusing the menu, I realize that I’m eating dinner at Saint James tonight! 95% of the menu is seafood-focused along with a smattering of vegetable and meat dishes. I put in my order for baked Oysters Ashworth and a red drum fish dish. As I wait, my tangy Fog Cutter shows up in a ceramic tiki tumbler along with a dish of spicy crackers! My Oysters Ashworth appetizer is placed in front of me and it’s a beautiful dish! 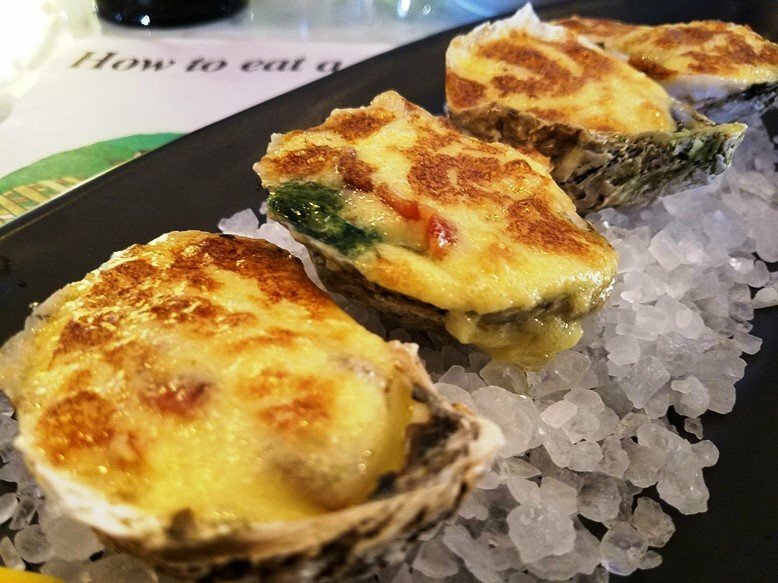 Bright yellow, seared Hollandaise sauce covering up spinach, bacon and the oysters all served on top of rock salt. The hollandaise shows off a lemony tang which cuts through the richness of the butter, oyster and bacon. With four on the plate, there’s a lot to eat here for a solo diner. And I’m definitely looking forward to trying some raw oysters here, sometime soon! My red drum entree is next and it’s a stunning plate! The fish is served on top of crawfish “butter” and fried dirty rice, you get a New Orleans etouffee feel here. 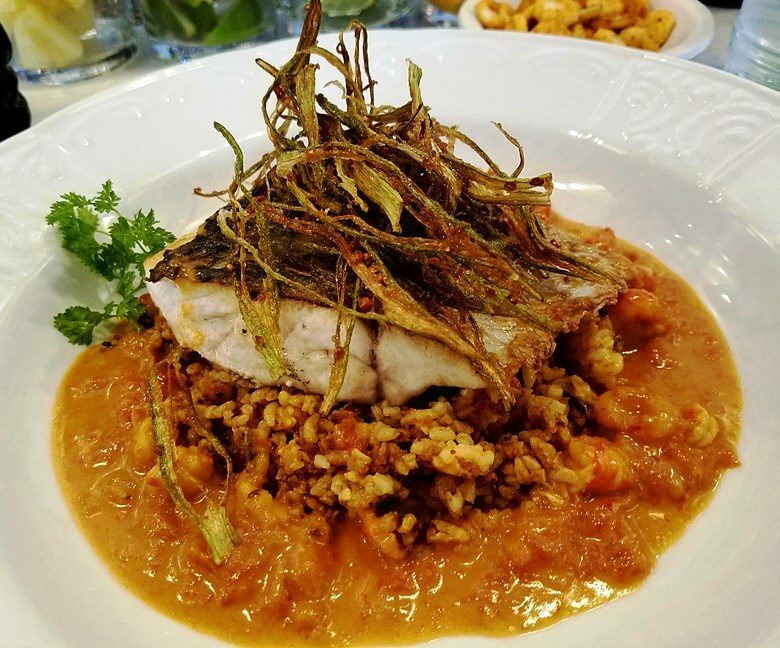 The red drum is a large, perfectly seared meaty whitefish that plays off well with the savory crawfish and spicy rice. But what really makes the dish are the long slivers of fried okra on top which give an awful lot of delicate flavor and texture to the meal, very inventive. Overall it’s a very creative and well-executed plate taking advantage of this fleshy and firm fish. Entrees at Saint James Seafood run in the $20 to $32 range with appetizers from $8 to $14. As you can guess, service was solid throughout the meal. Saint James Seafood was heavily staffed for its opening day and I suspect they will do well here given the overall dining experiences I’ve had in their sister restaurants. 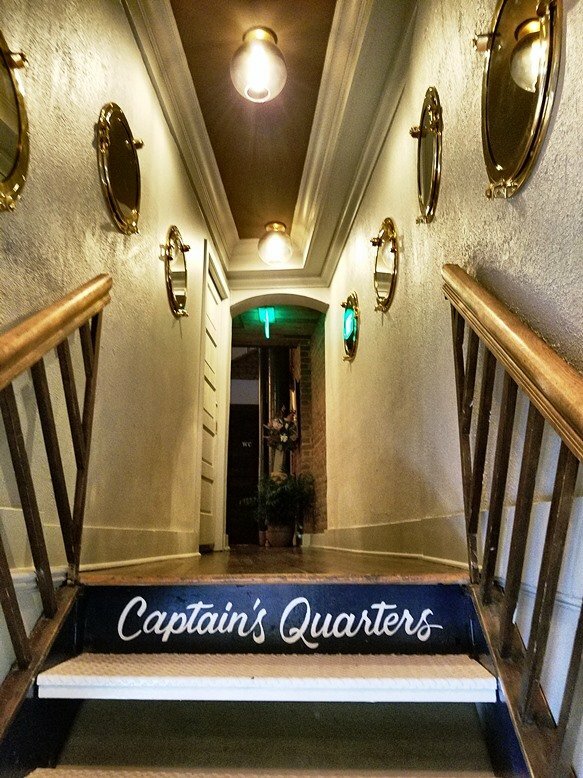 After the meal, I explored the upstairs area of the Saint James, called the Captain’s Quarters. Take the stairway on the ends of the dining room, up the non-slip metal stairs and through a narrow hallway to reach it. While it’s primarily for private parties, there were seated diners in here when I visited. 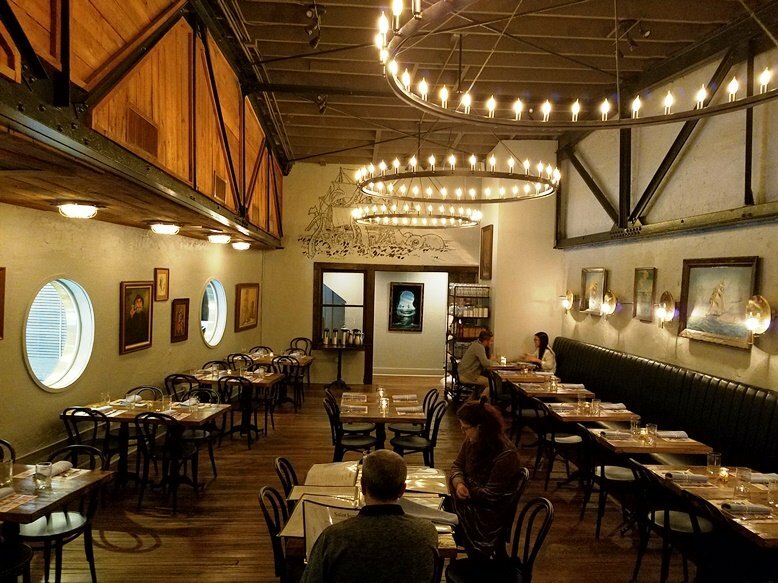 It’s a very cozy and more traditional space compared to the downstairs, showcasing a lot of warm woods, nautical paintings, three beautiful circular chandeliers and portholes that look out on the main dining room. Very cool and very well designed, a quiet spot compared to the bustling main dining room.